Kemal Shaheen discusses how learning to reflect and adapt opens up new possibilities. He shares how this approach is making a difference to the strength and sustainability of Southern library networks. Otto Scharmer, senior lecturer at MIT Sloan School of Management, writes that “…the root of the English word leadership, ‘leith’, means to ‘go forth’, ‘to cross a threshold’. His colleague and friend Peter Senge elaborates – ‘the threshold to which ‘leith’ refers, in my understanding, is when one steps ahead across a zone of uncertainty, or fear, or incompetence….’ For both Scharmer and Senge then, if one is to lead in a world that is increasingly volatile, uncertain, complex and ambiguous (VUCA) it requires letting go of the old by calling into question our rigid mental maps and cosy certainties. It requires us to step into uncharted territory so that one can ‘lean into and learn from the emerging future’ as Scharmer puts it. These insights lie at the heart of INASP’s partnership with Caplor Horizons ‘Leading in the Library: a learning lab for sustainable access to knowledge in developing countries’, which seeks to inspire and enable library leaders to learn differently, think differently and act differently – supporting them to build stronger and more effective organizations in the crucial areas of leadership, strategy and influence. Scharmer, Senge and Caplor Horizons would all, I think, acknowledge that to learn differently, think differently and act differently requires a ‘self-reflective’ turn – bending the beam of observation and attention back on ourselves so that we can challenge our deepest assumptions and question our cherished ‘truths’. 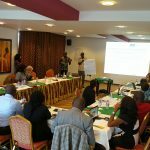 Below I explain how we are, in a relatively modest way, helping library leaders in Ghana, Zimbabwe, Kenya and Uganda to make some small steps towards this. However, true to the spirit of self-reflective inquiry, I preface this with a personal reflection of my own. At the time, this story helped me to understand in a deeper way that it is worth cultivating a mind-set that enables you to engage with unexpected challenges by being open and receptive to the opportunities that are emerging rather than re-playing a broken record in your mind about ‘what might have been’. For me, this is the essence of ‘leaning into and learning from the emerging future’ and it is underpinned by a pervasive sense of possibility. 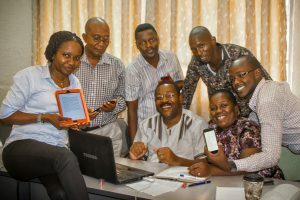 It is this pervasive sense of possibility that characterizes the Caplor Horizons ethos and the spirit of our Leading in the Library initiative, which has, at its core, a commitment to ensuring that developing-country researchers can access cutting-edge thinking from around the world in the form of electronic journals and books. 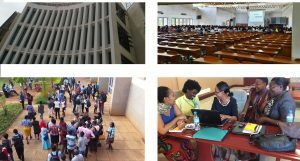 Our project is helping to build the capacity of our library consortia partners (groups of libraries that collaborate to coordinate activities, share resources and combine expertise) so that these resources are affordable for, and accessible to, developing-country researchers. In 2016, INASP helped to secure savings of about US$98 million (£79 million) for universities and research institutes across Asia, Latin America and Africa, enabling access to vital research that can help Southern researchers find innovative solutions for major development challenges like climate change, food security, natural resource depletion and conflict transformation. Taking an iterative and adaptive approach we have designed a three-phased programme in each of the countries (Ghana, Zimbabwe, Kenya and Uganda) – driven by experiential learning exercises which enable participants to challenge their assumptions around key themes. We understand that we cannot adopt a ‘one size fits all’ approach to consortia capacity development. An off the ‘shelf training package’ will not adequately address the complex and often divergent needs in the four countries. 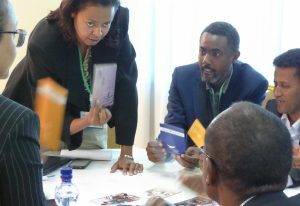 As such, phase one involves a small team from INASP and Caplor Horizons working with the consortia in each country to help refresh their strategy and take a deeper dive into the local context – exploring emergent issues and priorities. A key component of the project is the unique talent pool that partnering with Caplor Horizons enables us to bring to the learning lab. 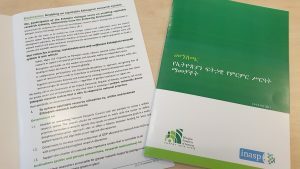 With a team of 50 advisors who have expertise across the public, private and voluntary sector and generously give their time on a pro-bono basis we are able to pull together teams with the right skills and experience to address the issues that our consortia partners feel are most important to them. This might be cultivating an entrepreneurial mind-set to help with fundraising or exploring issues of institutional power and inequality, for example. Each phase builds on, and is informed by, learning from the previous visit in an iterative way. In between the three phases, our learning lab provides opportunities for consortia to share learning and access one-to-one mentoring support. We do this through webinars. For example, earlier this year, 30 people came together from across five countries to consider what it means to develop an entrepreneurial mind-set – a theme that was raised in our phase one visits to Zimbabwe, Ghana and Uganda. We also provide online coaching and mentoring support through the Caplor Horizons advisors where it will have most impact. As Professor Sharon Turnbull from Caplor Horizons argues in a paper she wrote about the kind of leadership that is required in a VUCA world – it has to involve Sense Making (an openness to alternative interpretations of reality); be Relational (build creative connections), Adaptive (with a high tolerance for ambiguity and uncertainty) and involve Stewardship (attend to the needs of both the planet and future generations). All of which require a leader to cross a threshold and when setting out for Paris travel as though one may end up in Rome….or Kampala or Harare. 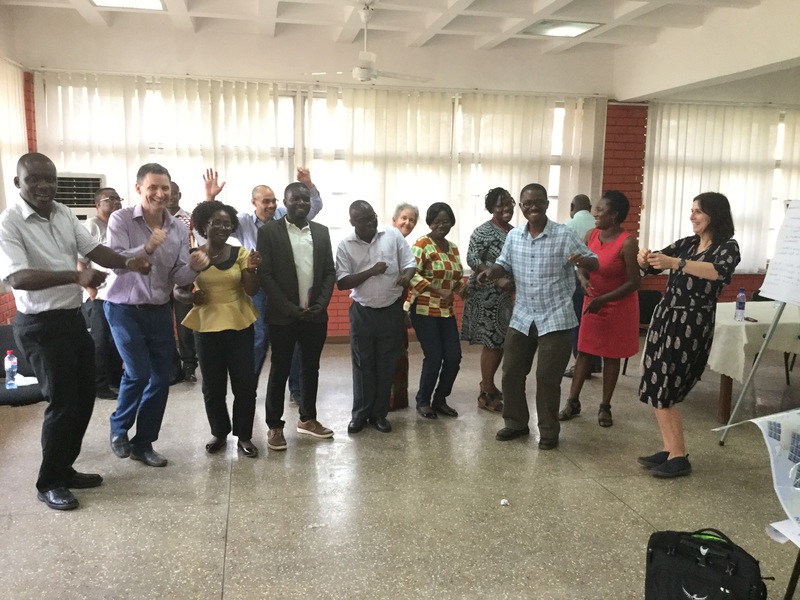 Photo: Participants in Ghana celebrate the end of a productive and inspiring two days of Leading in the Library in January 2017. Next week INASP and Caplor Horizons will be in Ghana for the second phase of Leading in the Library with local library consortium CARLIGH. Has inspired me to make space for some self reflection. Will go on to read the s. turnbull paper. Thank you for sharing the journey story- “Rome” can hold sights too!